Happy Spring, everyone! 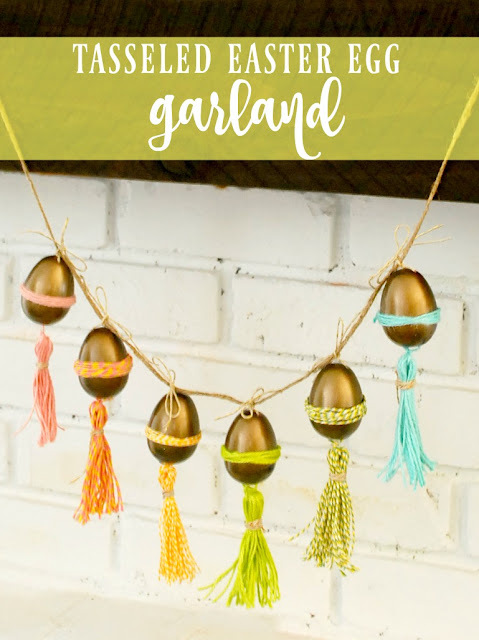 Steph at The Silly Pearl here with a little craft tutorial to use up some of those plastic Easter eggs - my Tassel Easter Egg Garland. 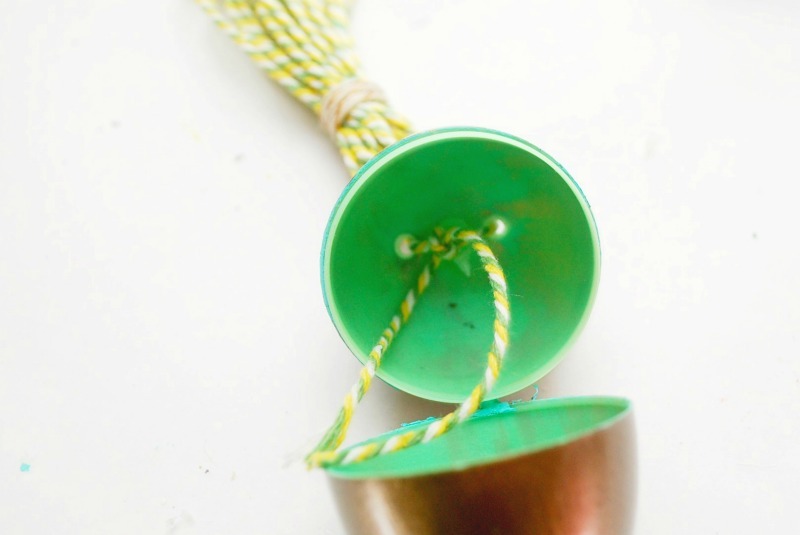 Here's how to make one for yourself. 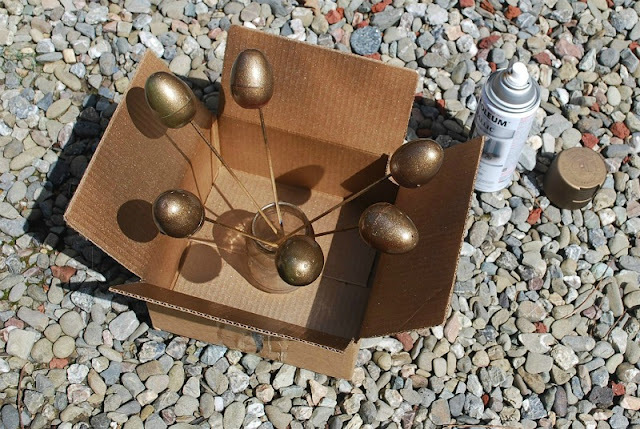 First, spray painted your plastic Easter eggs. You can do any color you like and any number of eggs you like. I chose a metallic bronze color. 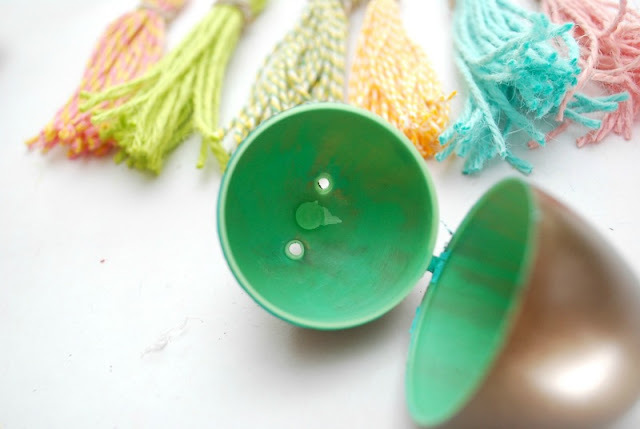 To keep my hands clean, I poked each egg with a skewer and stood them up in a jar, then I placed the jar inside a box. Then I spray painted the eggs without getting paint on myself. 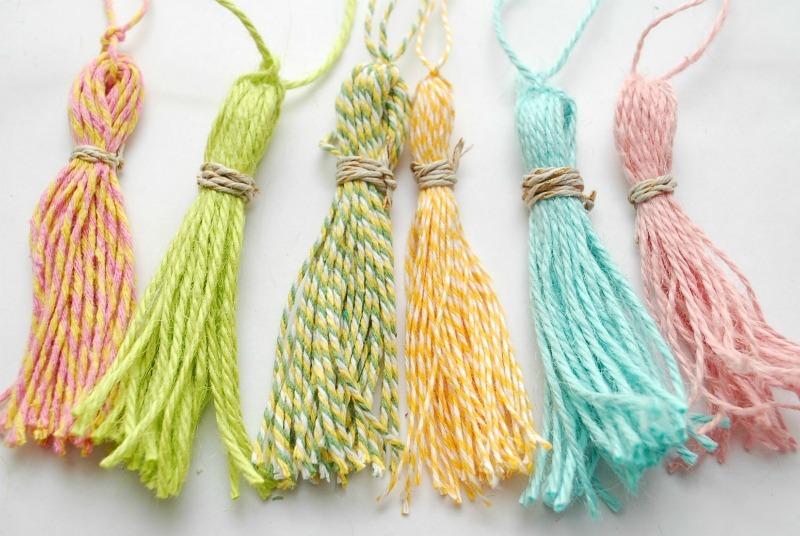 While the paint dries (I did two coats), make your tassels. I first determined how long I wanted my tassels, and cut a piece of cardboard about that size (I figured about one and a half times the egg would be a good proportion). Why do cats suddenly appear every time twine is near? 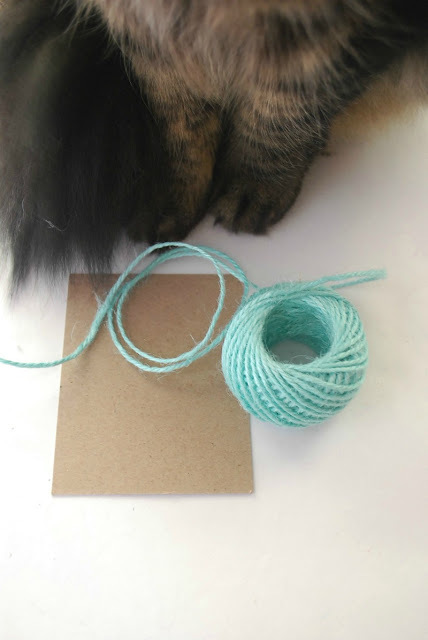 Then wrap the twine around the cardboard, oh about fifteen or so times. 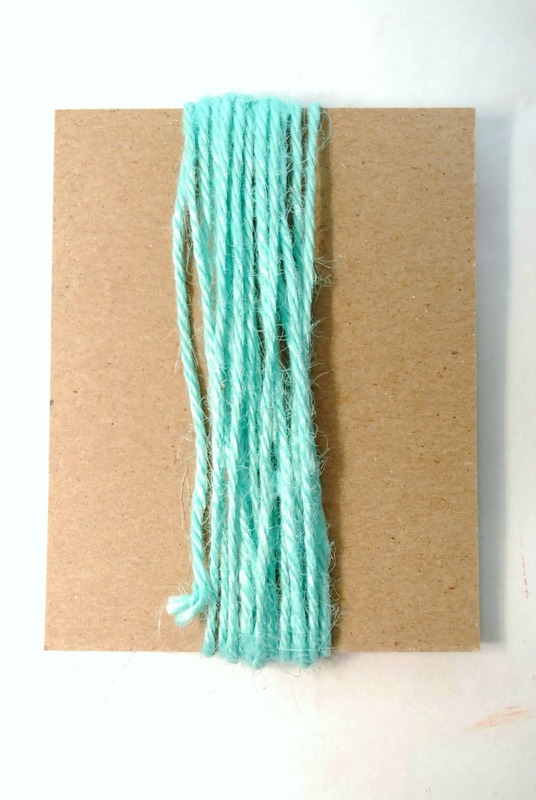 To secure the loop of twine, first I slipped another length of twine between the cardboard and the loop of twine, and tied a knot at the top. I left about 5 inches of length (this will eventually be the twine that ties to the egg). Slip the loop off of the cardboard. Then take another length of twine (it can be the same color or different color, whatever you prefer) and, about one inch from the top, wind it around the twine loop. 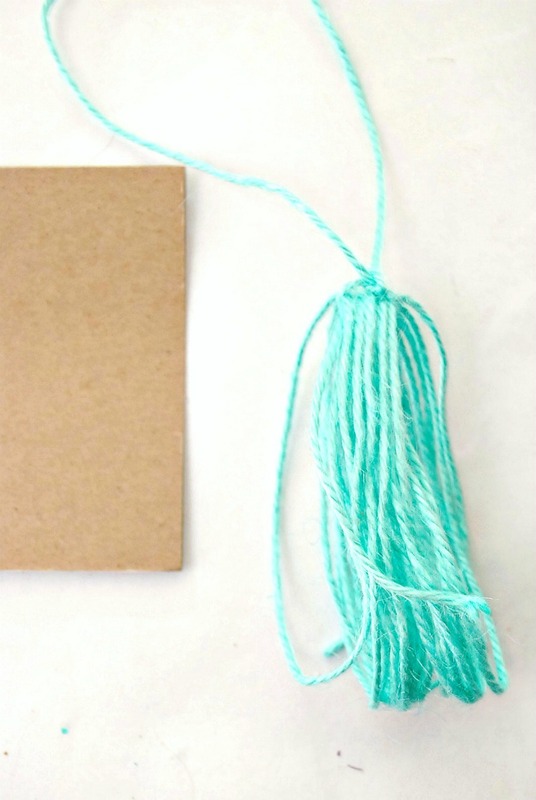 Insert your scissors through the other end of the twine loop and cut, to create the fringy end of the tassel. Make as many tassels as eggs. 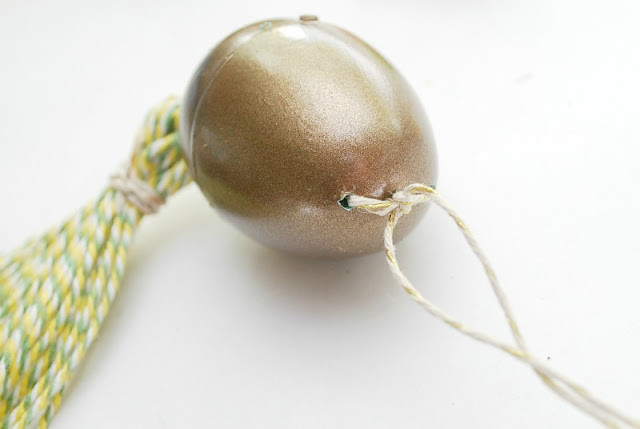 When the paint is fully dry, carefully open an egg. Usually, Easter eggs come with holes on the top and bottom of the egg, sometimes in pairs and sometimes just one. 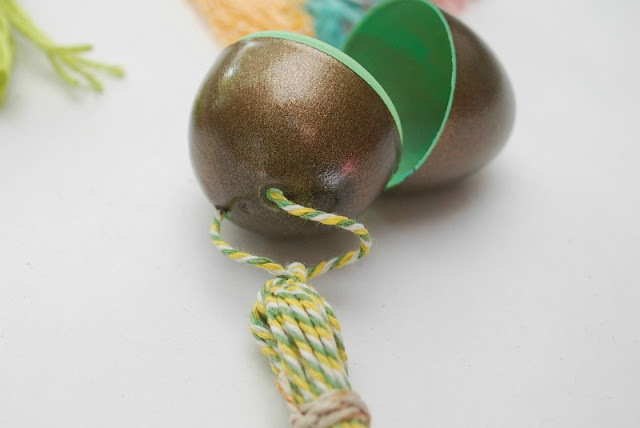 Take one of your tassels and thread the top piece of twine through one of the holes in the egg, from the outside in. 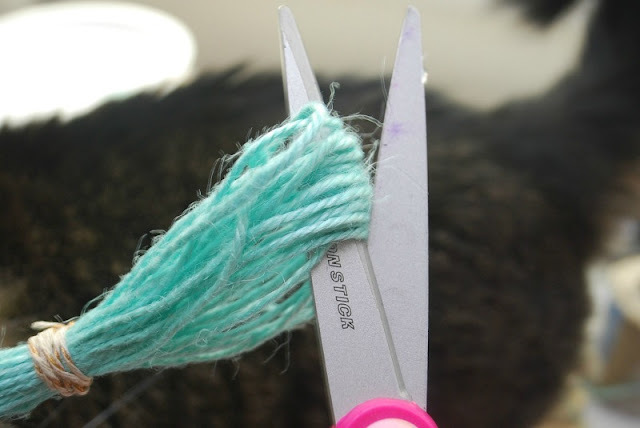 Then thread the other end through the other hole. Note: if you have just one hole, thread both through the hole. 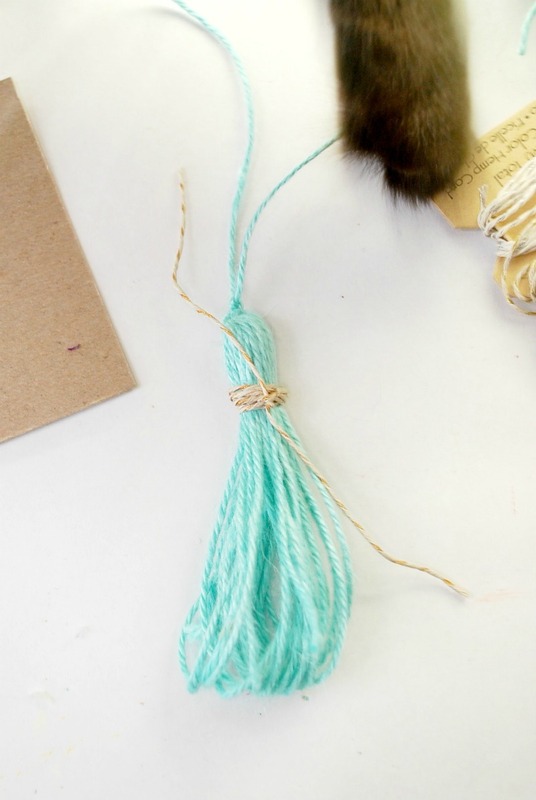 Use a tapestry needle to help thread the twine through the holes. Tie the ends together on the inside. On the other end, thread another length of twine through the holes. 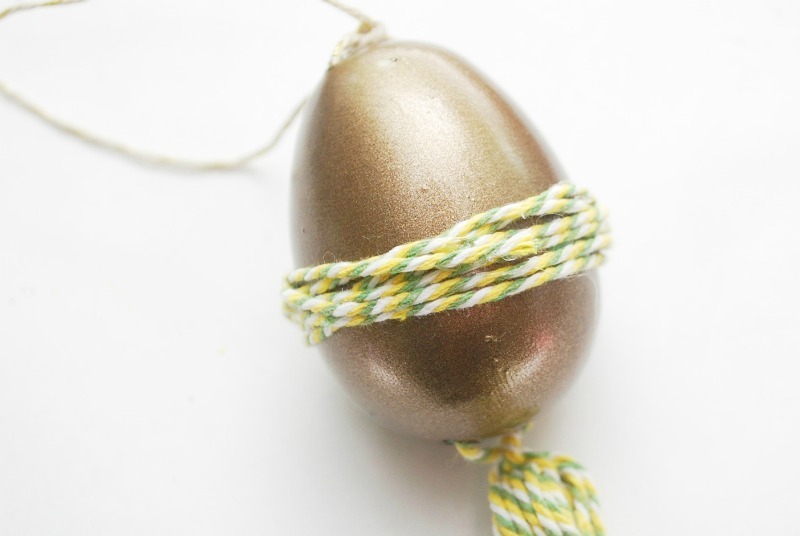 This twine will be for hanging the egg. The egg was looking a bit plain. You can embellish it however you wish. I simply wrapped some twine around the egg. This also covered the seam between the two halves. 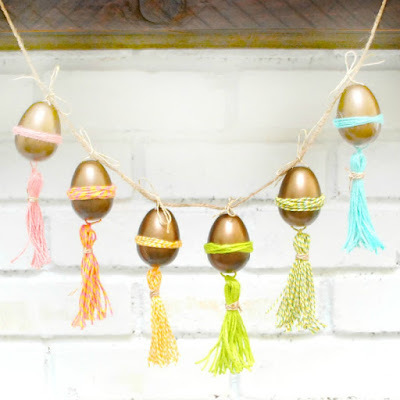 All finished with my Tassel Easter Egg Garland! 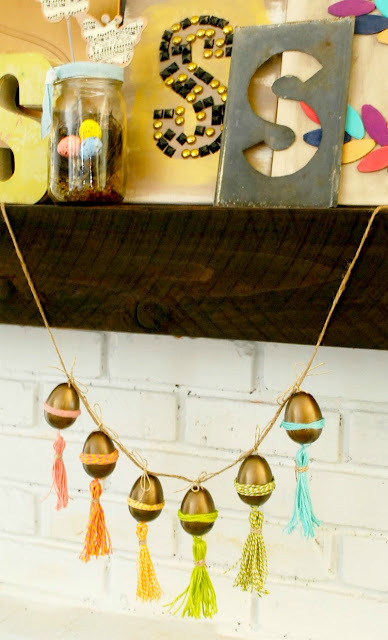 I hung my Tassel Easter Egg Garland on my mantel. 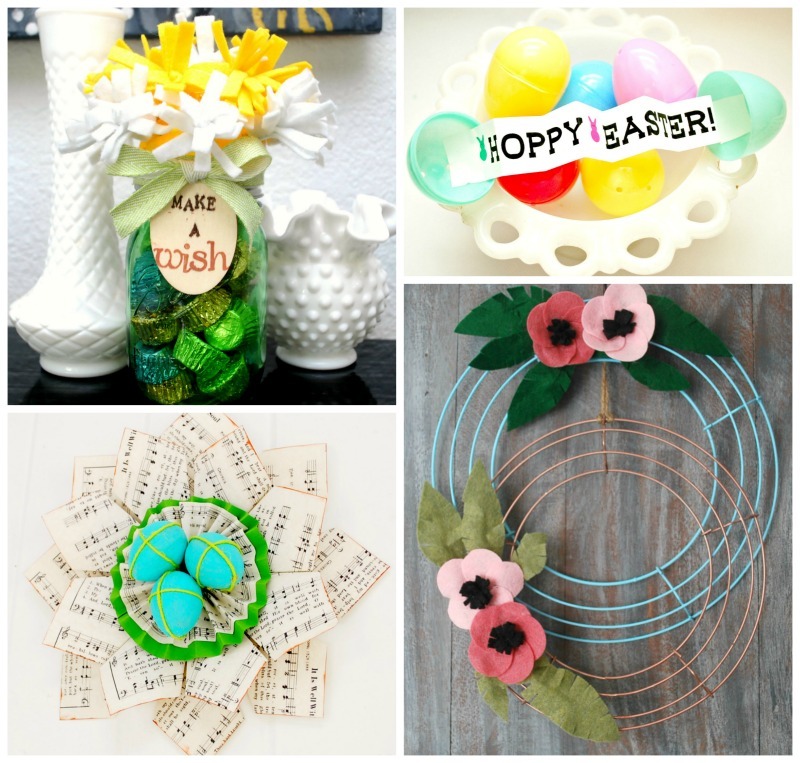 This was such a fun way to dress up a cheapo plastic Easter egg. We have a whole container of them in the playroom. Surely my girls won't miss six of them? Thank you so much, Kim, for having me on the blog today!